Thanks to my friend Ken Symes for letting me know about this great sales funnel story. Tim Hortons is a coffee shop but it might as well be Canada’s religion. There are other coffee shops in Canada, of course (there are at least 3 Starbucks within a five minute drive from my house). There are also regional coffee shops like a company called Country Style, who are building a presence in Ontario and trying to win out against the Canadian’s default choice: Tim Hortons. Think of it this way: Tim Hortons is the McDonalds of Canadian coffee. And Country Style is like Wisconsin Burger — serving the good people of just one state and battling against the juggernaut. On a regular basis (annually? Maybe more frequently), Tim Hortons has a promotion called “Roll Up the Rim to Win”. You buy a coffee, drink it, and then roll up the rim to reveal if you’ve won a prize. You might win a car, a donut, or all kinds of other stuff. Of course there are lots and lots of “try again” rims. Tim Hortons is already INSANELY popular when they’re not running the promotion but they become even crazier during their Roll Up the Rim contest. So how do smaller companies like Country Style win out against Tim Hortons? They aren’t national so they don’t have the the same reach as Tim Hortons. They don’t have the same fanatical consumer base as Tim Hortons. As a result of those two things, they don’t have nearly the budget to market a similar promotion or offer prizes on the scale of Tim Hortons. But they don’t have to. Instead, Country Style did something quite clever: They are creating their own buzz and stealing customers from Tim Hortons’ sales funnel. 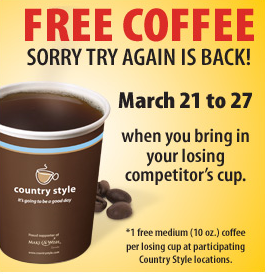 They’re doing this with a promotion called “Sorry Try Again” and basically it works like this: If you bring a Tim Hortons rim to a Country Style location, you get a free coffee. As well, Country Style knows that few people buy ONLY a coffee. They probably buy a coffee for themselves and their friend. Or they buy a coffee and a donut. Which makes this promotion a good way to increase non-coffee sales or to mitigate losses from their loss leader. It is a risky move: They could give away tons of free coffee and not gain anything from it. And they currently don’t have a chance of gaining significant marketshare from Tim Hortons. However, they should be able to at least present themselves to some people as a viable alternative… and that could be the foot in the door they need. If you are the scrappy underdog who is competing against a juggernaut of a competitor (who has a seemingly unending marketing budget), it’s time to steal their customers. If they run a promotion, don’t bother running a similar promotion. Instead, find a way to get into their promotion!